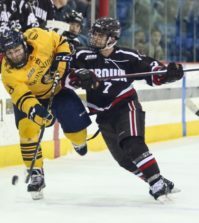 Connor and Kellen Jones wasted no time in picking up where they left off last season, as they led Quinnipiac over Acadia Sunday, 5-2, in an exhibition game at High Point Solutions Arena at TD Bank Sports Center. “Everyday you’re like, just one more day closer, and it’s so nice to be back and competing again,” Connor Jones said. 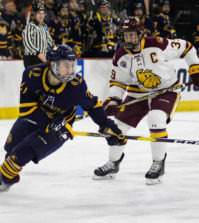 Connor and Kellen Jones combined for 46 points last season, and both appear poised for another great year as they connected for two goals and two assists between them. “He made some great passes to me, and I was just in the right spot, right timing,” Connor said. The Bobcats got things started early in the fifth minute when Jeremy Langlois lit the lamp with a shot to the lower right corner to put the Bobcats up 1-0. Thirteen seconds later, Kellen connected with Connor for his first of two goals, giving the Bobcats a 2-0 lead. Connor scored again at the 11:26 mark, extending the Bobcats lead to 3-0 before the end of the first period. 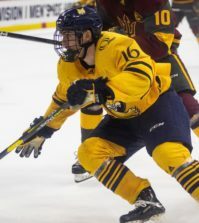 Quinnipiac’s success on the offensive side of the puck continued well into the second period, as they notched two more goals from Zach Davies and Kevin Bui to give the Bobcats a 5-0 lead. Despite goals by Acadia in the second and third periods, it proved not to be enough as Quinnipiac walked away with the win. The Bobcats open their season Friday night at Ohio State as part of a two game set. 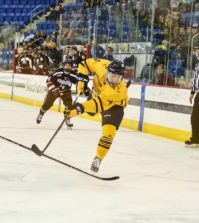 Quinnipiac head coach Rand Pecknold is looking forward to the start of the season.